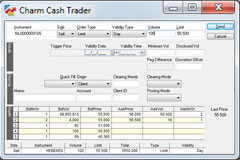 Charm Cash Trader for trading on all stock and bond markets of Euronext, Luxembourg and Xetra. 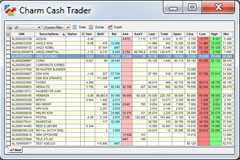 Charm Cash Trader is fast and intuitive. 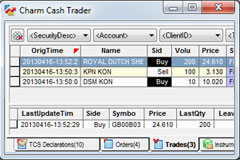 Traders love its user-friendly interface. Customer order entry is extremely easy. You can enter orders from every marketview. By double-clicking or using the right mouse button an order ticket will be opened. The Time and Sales view shows an instruments price trends during the day. 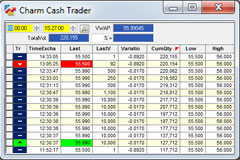 You can also easily calculate the Volume Weighted Average Price for a given period.